Our warm and personal wishes to you & all for a very happy & prosperous 2019!!!. 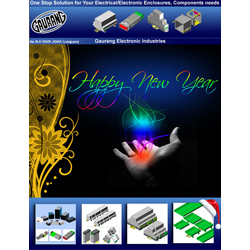 We hope the New Year grants you with lots of joy, health, great moments and good business!!! Our main objective consists of offering you good quality products, the best service, supporting long term relationship with you and your company. In coming New Year 2019 we look forward to a growing mutual business relationship. Remember that our commitment is with you. Always. 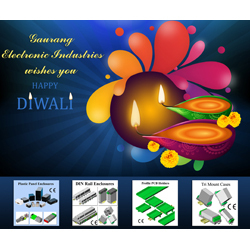 Gaurang Electronic Industries wishes you a very Happy Diwali & prosperous New Year accompanied by your family and friends. In coming New Year we look forward to a growing mutual business relationship. Remember that our commitment is with you. Always. 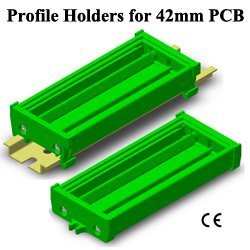 Profile PCB Holders provides quick & easy mounting of PCBs on Din Rail & Wall / Panel. Profiles are available in standard 1 or 2 Meter length or it can be easily cut to required custom lengths. Profiles are also available with custom length from us with accurate cutting. 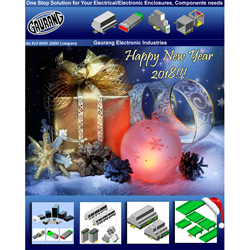 The typical applications of Profile PCB Holders include Mounting custom PCB and Standard interface modules for Din Connectors, Sub Miniature Din Connectors, Flat Cable Connectors also Modules like Relay modules, Opto - coupler modules, Switch modules, Fuse modules, Diode modules, Veristor Modules, Power supply modules, Over Voltage protection modules, Data Transmission & Receiver Modules, Analog/ Digital Converter etc. Din Rail mounting in EN 60 715 TH35 DIN rails. For 42 width PCB size. Available in standard 1 meter and 2 meter extrusion length. DIN Rail Mounting: The Profile is mounted on DIN rail with help of End Piece with Rail mounting foot Left side and Right side; PCB slides into grooves on the extrusion. Two End Pieces are fixed with screws on extrusion to hold PCB securely in place and to keep out foreign objects. Panel Mounting: To panel mount, Two Panel Mont End Pieces which has an integral mounting flange with hole slot. 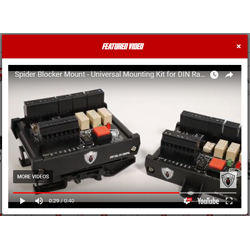 There is no need of Foot Pieces in Panel mounting. Note: Save time by ordering Kit with our preassembled Profile Holders, made from profile extensions cut to size and two End Sections. They can be ordered for DIN rail or panel mounting for custom length. Our warm and personal wishes to you & all for a very happy & prosperous 2018!!!. In coming New Year 2018 we look forward to a growing mutual business relationship. © Gaurang Electronic Industries. All Rights Reserved.